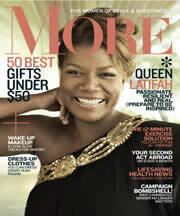 Free 10-Issue Subscription to MORE Magazine | A Savings WOW! Fill out a short form to see if you qualify to get a free 1-year subscription to MORE magazine, courtesy of FreeBizMag.com. No credit card required. No purchase necessary. Quantities are limited, so act fast if you like this deal. MORE magazine is edited for the smart, sophisticated 45+ woman, addressing the concerns of her life today with articles on health, style, money, family, home, travel, love, entertainment and much more. You will get a complimentary 10-issue subscription to MORE magazine when you sign up and qualify. We get many magazines through FreeBizMag.com and other free magazine resources and that has helped us cut our budget greatly for magazines and reading material. They also make great gifts for someone you know who would like More magazine! Get your free MORE magazine subscription.